First Whale Report of the Season! We can hardly believe it’s Whale Watch Season again (where has the year gone? )…but we’re happy to report that on Saturday, on our first official Whale Watch Cruise of the year, we saw whales! We were about 1/2 way through our Wake up with the Whales Cruise before Captain Ryan saw some spouts near the Mauna Lani Resort, so he turned towards shore, and we “beat-feet” to the area where he had last seen them. After about 10 minutes of waiting at idle, we were rewarded when a Humpback surfaced and spouted three times off our starboard bow before disappearing. We waited patiently, and about 25 minutes later we were surprised when not one, but TWO whales surfaced and spouted off our port bow — we got some great views of their flukes as they sounded right in front of us. On Saturday’s Whales & Cocktails at Sunset Cruise, we also got to see a Humpback spouting near the Puako/Hapuna area. We watched this whale sound, and right after that we thought we saw part of another whale slide under the surface…we can’t say for sure if it was a calf (it’s pretty early for us to see calves), but we can’t say for sure it wasn’t! On Sunday’s Wake up with the Whales Cruise, we weren’t as lucky. We didn’t see any whales, so we called the trip a “Fluke” and invited everyone aboard to join us again on another Whale Watch Cruise for FREE! Ocean Sports Whale Fact of the Day: Humpbacks can be found in all of the oceans of the world — and researchers now recognize 14 distinct populations of Humpback Whales. The whales we see here each winter are part of the North Pacific population. 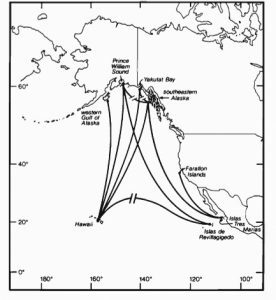 “Our” whales feed in the waters off the Gulf of Alaska during the summer months and swim the approximately 3000 miles to Hawaii each year presumably for social reasons…giving birth to their calves and mating. ← First Humpback of the Season!